Linking of VISUAL MESA to the Plant Information (e.g. PI) System. Training for VISUAL MESA's users. Optimization of the entire steam system including pump and compressor drivers, steam production from boilers and heat recovery steam generators, and electrical production from gas turbines and turbo generators, has been considered. Substantial operation costs savings have been obtained from Optimization. Additional savings are obtained by the identification of wasted steam and operating problems, as well as through engineering off-line "what-if" studies to investigate optimal alternative Utilities Systems configurations. The Repsol YPF Tarragona Refinery located in Spain, with a refining capacity of 8 millions of Tons per year of crude oil, operates a large and complex utilities system. As it is usual in refineries and large chemical plants, they are very large energy users that have several degrees of freedom. Manipulating these degrees of freedom with a cost based optimization program usually can result in significant savings in operating costs, requiring only a small investment. This is particularly important within deregulated electrical markets. Since the electrical system poses one of the main economic trade-off with a steam system, electrical deregulation provides many new challenges to operate the overall combined systems at minimum cost. In order to successfully implement the optimization recommendations, an operator oriented, well implemented and understood tool is needed. Among the issues usually found in large complexes it is necessary to highlight that operators are generally not concerned about global energy costs reductions (i.e., Refinery Wide) but only about the Unit(s) under his/her direct responsibility. Many times, there is more than one responsible in the site (serving different areas) that implies difficulties in the application of coordinated strategies to reduce overall energy costs. Other important aspect is that utilities systems are continuously evolving and sometimes there is a lack of sensors that need to be addressed properly, either estimating or calculating the non measured consumptions with a model help. Furthermore, utilities systems have several constraints, coming usually from the operations side. Finally, it is necessary to remark that the unattended convergence of a global Utilities System optimizer, that is, considering energy costs of the whole site on an hour-to hour or day-to-day basis, it is not a minor issue due to its complexity. 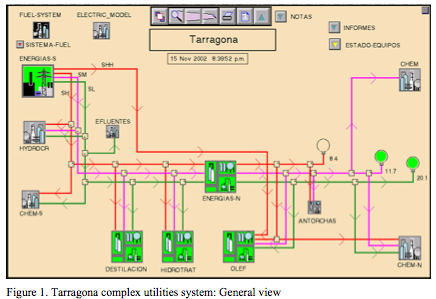 All the above mentioned items have been addressed successfully at Tarragona Refinery by the VISUAL MESA on-line computer based steam management software. Its successful implementation allowed the Refinery to be more energy efficient and reduce the overall Utilities system operating costs. Monitoring: VISUAL MESA monitors the entire steam, boiler feed water and condensate system and highlights problems. As an example, large changes in steam flows are flagged so that operators can quickly find out what changed and talk with the people responsible for the change. Using this feature to find and correct problems that cause large changes in the steam system can reduce the chances of a Refinery or individual process plant shutdown caused by the steam system. VISUAL MESA also monitors equipment performance. For example, gas turbine performance (i.e., efficiencies) can be tracked and maintenance scheduled when economically justified. Optimization: VISUAL MESA optimizes the entire steam system including pump and compressor drivers choice (i.e., turbine or electric motor, when dual driver is available), steam production from boilers and heat recovery steam generators, and electrical production from gas turbines and turbo generators. "What-If" Engineering Studies: VISUAL MESA is used on a routine base to study the benefits of making both small and complex changes to the operations or equipment of the steam system. Euro savings are found by comparing a given base case to the optimized case that includes the proposed change. Examples of "What- If" studies include evaluating turbine/motor switches, building a new plant or plants, and scheduling utilities for a Refinery wide shutdown. On start-up, effective, accurate planning using VISUAL MESA can save plant down time and result in building the most economic project and achieving the projected operating cost savings. Auditing and Accounting: Using VISUAL MESA's data validation techniques, it can be accurately accounted for steam use and track down waste and inefficiencies wherever they exist. Also, VISUAL MESA allows tracking performance online so these savings are maintained year after year and can also be properly historized. In this work, implementation of VISUAL MESA to reduce energy costs and the main benefits already obtained are summarized. After a brief description of the Utilities system, objectives of the implementation are detailed. Then, implementation steps are commented. Finally, benefits and conclusions are presented. In the following paragraphs, the model build and optimization implementation are briefly described. Tarragona refinery complex shares its Utilities System also with a neighbor Olefins Plant. A complete model of the Utilities system of the overall Utilities System was built. The model contemplates the whole steam, boiler feed water, condensate and power system. Steam is generated in several different Units, with conventional boilers, heat recovery steam generators and two cogeneration units. The five steam pressure levels were contemplated and all the units considered in high detail, including all the consumers and suppliers to the respective steam, BFW and condensate headers. Detailed efficiencies curves of the biggest turbines were included in the model and they are adjusted continuously with on line validated data. Figure 1 shows a view of Visual Model at the highest Plant level. By navigating through the model, the each individual Unit of the system can be monitored in detail. VISUAL MESA has mathematical models and optimization routines built-in to calculate how to run the steam and electrical systems at the minimum overall cost and still meet the required plant steam demands and other plant constraints. Level 2: adds the optimization of other continuous variables including turbo generators, extraction/induction/condensing turbines, etc. Since VISUAL MESA is an operational oriented tool, the proper training of the operating personnel is a very important project step. The different shifts have been trained by using the Repsol Tarragona model. Inputs gathered from the operators during and after the training classed have been very useful to make easy the day-to-day use by improving the views and the displayed information. Then, when analyzing the optimization recommendations, a foreman with coverage of the whole Refinery, Utilities and Olefins Units was the indicated person to coordinate the implementation on day-to day basis. With respect to lack of sensors, VISUAL MESA utilizes calculated or estimated data in case a sensor does not exist or has a temporary failed state. Usually, the main meters needed for optimization are: Cogeneration (steam flow rate), Boilers (steam flow rate), Letdown valves, Vents, Induction/Extraction/Condensing turbines flow rates and Motor- Turbine on-off statuses. Some motor-turbine statuses are actually updated manually by plant operators. An improvement is actually undergone to automate the capture of the on- off status from the plant information system. 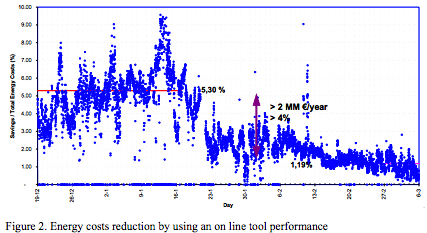 Average Benefits of more than 2 MM € / year and still being improved, due to OPTIMIZATION ONLY, has been obtained. Figure 2 shows the performance during the mentioned period of time. An on line tool for energy costs reduction has been installed to optimize the Repsol YPF Tarragona refinery Utilities System, comprising a medium size Refinery and an Olefins Plant. Energy costs reductions have been obtained taking advantage of the VISUAL MESA software functionalities. It demonstrated to be a robust optimizer and well suited to be used on a routine basis by operators. The model is also used to evaluate a priori what-if scenarios that include modifications or different operating alternatives of the Utilities Systems. Auditing and accounting of steam and Boiler Feed Water allows reducing wasting steam and identifying imbalances. Finally, continuous monitoring allows preventing plant upsets and helps to quickly identify steam wastes. It is important to emphasize the high involvement and motivation of plant operators since the beginning of the implementation. Coordination among plant areas in order to implement the proposed optimization recommendations is also a critical issue, so management involvement is crucial. The robustness of the tool helped operators to gain confidence on the system. Repsol YPF is actually undergoing implementations and feasibility studies of VISUAL MESA applications in several other locations.